Sorry for the delay but I did not have much time since we return from our summer holidays. I hope you all had a great summer. As I already mentioned in one of my last posts, we have had a vermicompost in our apartment since April of this year. It is a natural way of converting organic waste into high-quality fertiliser using worms. I cook every day. It is part of our journey to reduce our waste production and to eat healthier. I also cook for others so I have a lot of food scraps at the end of the day. Since we don’t live in a house with a garden, vermicomposting is the ideal solution to manage our food waste. At first, the idea of having a compost at home left me dubious. I was thinking smell. Worse, I was seeing me doing the maintenance. After all, worms are living things like my kids and my cat. So now, I must also keep these slimy wiggly things alive by feeding them with the correct food scraps and organic waste? Like I don’t have enough things on hands! But my husband was very enthusiastic about this new project. He loves projects. After he studied the various worm farms available on the market, he came to the conclusion they were all too small for our daily food scraps production – yes, I cook a lot and every day. He then decided to make ours from scratch. It turned out way easier than I thought and so much more cost-efficient! We bought the valve, the tube of silicone seal and 4 concrete blocks at Home Depot and borrowed a drill. 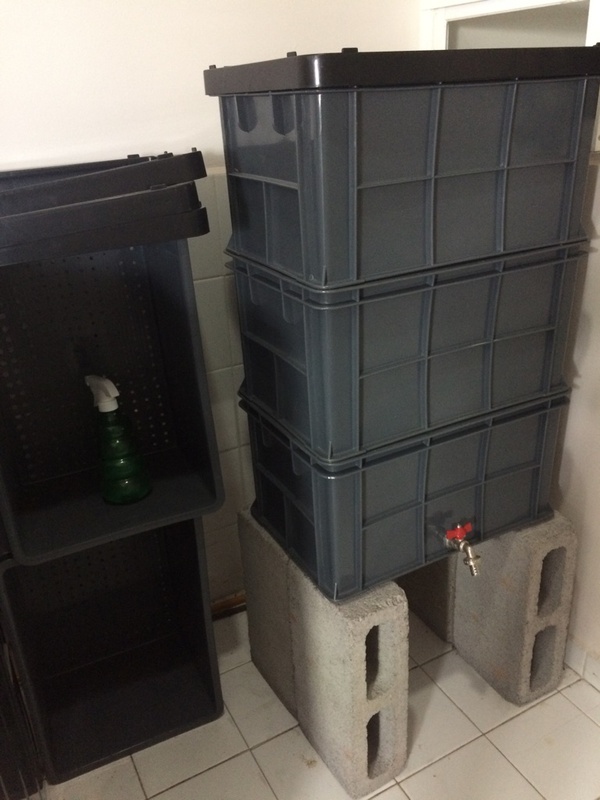 We ordered the plastic boxes from this vendor on Mercado Libre. It is very important that the boxes are made of hard non-transparent plastic, are stackable, have no hole from where the worms could escape and have a lid (you’ll only need one). We bought the redworms (eisenia foetida) from this vendor – they are called lombrices rojas de California. How many worms do you need? A rule of thumb here says 250g of worms/person if your household produces little trash. For instance, you have your lunch outside and you don’t eat as many fruits and vegetables. You will need 500g of worms/person if your household produces more kitchen trash. In our case, as I cook every day for my family of four and for my business, we ordered 3kg of worms. On the first box that will collect the fertiliser, we drilled a hole on the side of the box to fix the valve on. 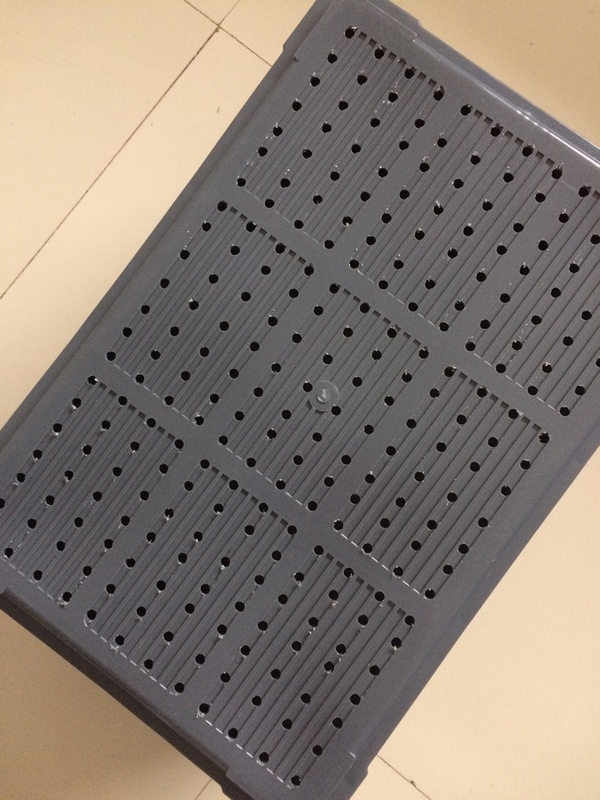 On the other 3 boxes, we drilled holes of 6 to 8 mm diameter every 2 cm on the bottom. The worms will be able to move from one box to another. This took us the longest but it is something very doable. Then we drilled ventilation holes of 1 mm diameter every 2 cm on one lid. It is preferable to place your worm farm in a draft-free room corner with a pretty consistent room temperature all year round. Worms are sensitive to temperature variation. The ideal temperature is between 15 - 20 degree Celcius. We have decided to go for our laundry room. We placed the box with the valve on the concrete blocks. If you decided to go for a table, place it on the edge of your table. This will enable you to easily collect the liquid fertiliser. We stacked a second box where we prepared a bedding that consisted of shredded cardboard and strips of paper (no glossy paper) with some crushed eggshells and two handfuls of soil. This mixture is said to be able to hold moist and allow air exchange. 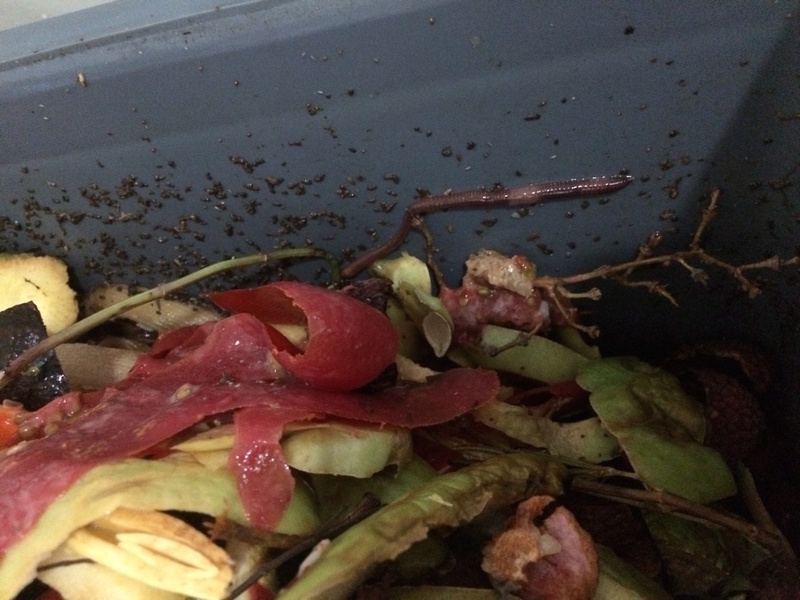 We transferred the worms into the box and added a few food scraps. We covered with few sheets of newspaper and sprayed some tap water to dampen the paper. And we covered with the lid. We then allowed the worms to acclimate to their new environment for 2 weeks before feeding them. Start with a little quantity of organic waste (food and paper) at a time per day and gradually increase to reach half or total of the worms weight. Remember that the smaller the organic waste, the easier and faster for them to eat. 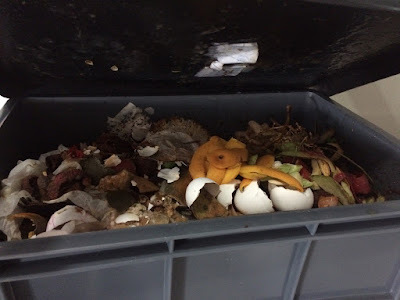 Once the level of food scraps and organic trash almost reaches the top of the second box – aka 2/3 cm height left, stack up another box and start feeding the worms through this third box. They will climb through the holes. We are very satisfied. It is low maintenance and the worms do an amazing job. I forgot to snap a photo but when I returned from our summer holidays, there ate almost all the food waste I fed them with before leaving. It does not smell bad at all, only a little bit when we open the lid to feed the worms. But when the lid is on, we smell NOTHING. And we collected 4 bottles of liquid fertiliser so far! We have happy plants. And cherry on the cake, it costed us around 1,000 pesos in total, red worms included.